Nearly all studios used a "still code number" on stills that could be used to identify it. When one finds an unidentified still, if a code number is present, one need only identify the studio, then the still can be identified. 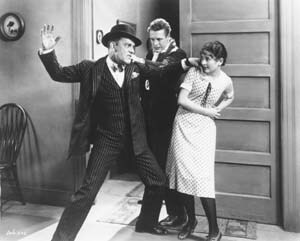 For example, the code for THE BIG CITY (1928, MGM) is 346. In the still above, the still code is in the lower left corner, and when magnified as shown in the lower image, the code for this still is "346-205," which means it is the 205th still in the series for THE BIG CITY. Note that many of the independent producers did not assign still codes; they merely assigned sequential numbers to each still, presumably because they had so few releases they didn't worry about keeping them straight. Early Universal releases would usually include the name of the director followed by the code number. For example, "DEGRASSE" is written before the number in the example below from A BROADWAY SCANDAL which was directed by Joseph DeGrasse. The Universal production number is #2873. The list below includes all Chaney still codes I am aware of. I also include the many titles for which still codes are not known in the hope that anyone out there can help add to this list.